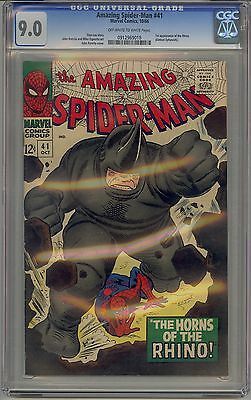 This listing is for Amazing Spider-Man #41 CGC 9.0. You will receive exactly what is pictured in the listing. Items will be shipped extremely carefully to insure they arrive in excellent condition. All S/H for this auction varies. I do combine items for shipping. Insurance is included with all shipping. For International buyers please note any custom fees charged by your country are your responsibility. I will always try to accommodate any special requests. If there are ever any problems regarding your purchase please contact me prior to putting in claims, leaving negative feedback, or giving out low ratings. I aim for 5 out of 5 stars all the time and will always do my best to fix any issues. I always make sure my customers are happy!!! !